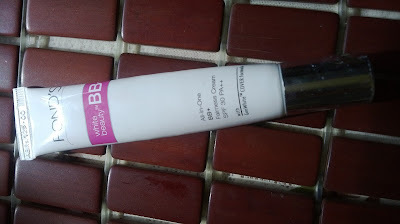 I am all for BB creams since I had my hand on the first ever launch in Europe, i.e. 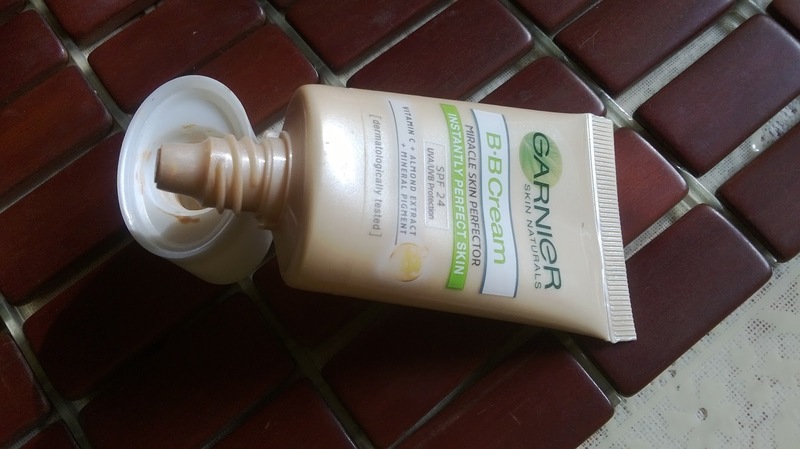 The Garnier BB Cream Miracle Skin Perfector. 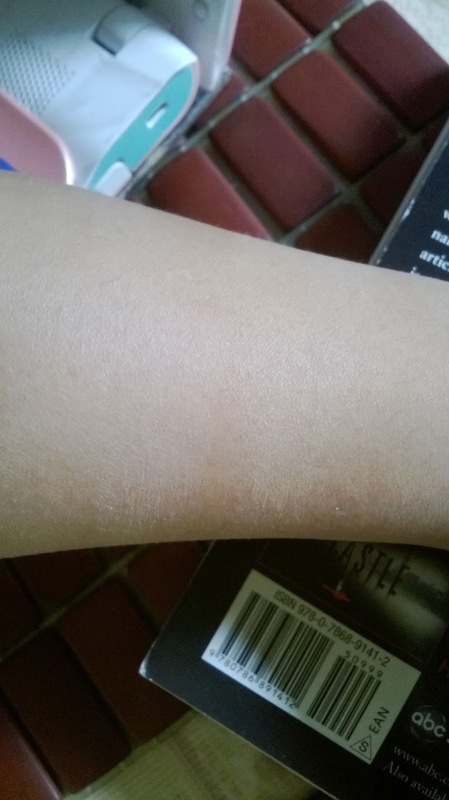 I have almost not touched any foundation since that time, partly because I don't get a perfect foundation that completely matches my skin tone...and partly because the good once are too expensive. 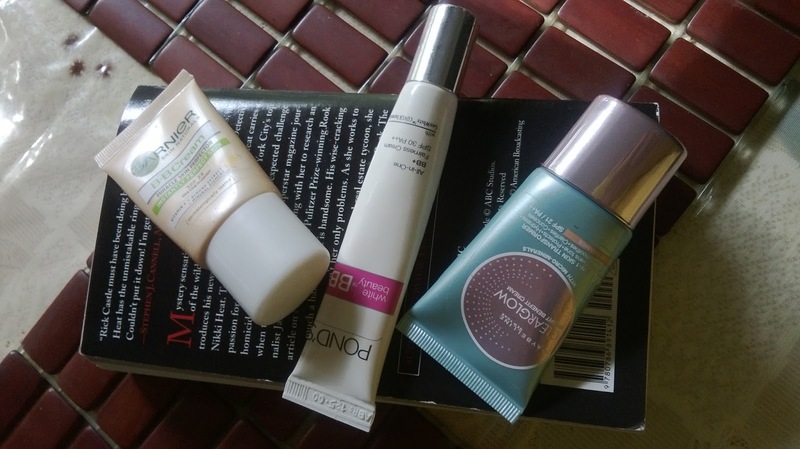 Anyway recently I have been trying the 3 most popular and affordable BB Creams available in India- The Garnier BB Cream Miracle Skin Perfector(Indian version), The Maybelline ClearGlow BB Cream and The Pond's White Beauty BB +All in One Fairness Cream. I will be talking about my experience following with some comparisons in this post. Garnier BB Cream Miracle Skin Perfector: This variety is quite different form the one that I had been using in Europe. The European version is quite thicker and had more coverage than this one. I would not say it is bad by any means. 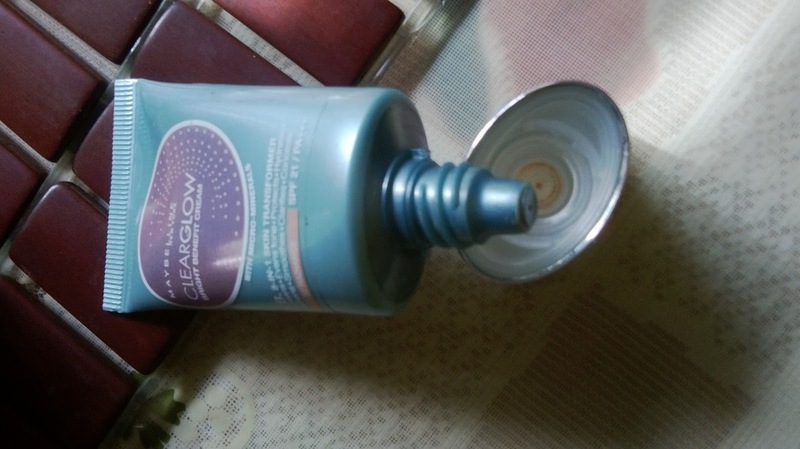 It does a fairly good job of adding some dewy glow to the skin because of its Vitamin C contents. 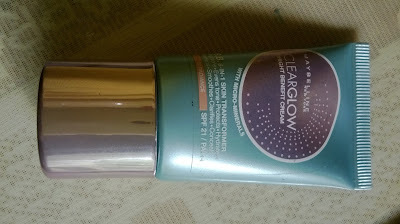 If someone is looking for some enhanced glow then this is the perfect product. 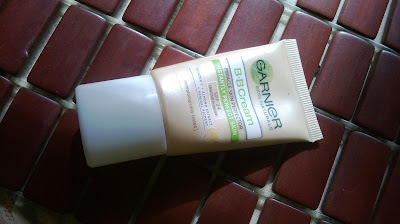 However, I expect some coverage from my BB Creams as I am totally off foundations nowadays. So for me it does not work. The staying power of the product is questionable too. It can last for at the most 2 hours with some setting powder. But women with oily skin like me will find it quite difficult as it starts to melt after an hour or so. The added advantage of the product is it has SPF 24 which is fair enough for sun protection. It claims to moisturize for 8 hrs with its almond contents which is ok on my skin but I doubt if that is possible on skin that is too dry or mature. Another claim they make is the Zero Imperfections which again is questionable as it hardly covers any spots or darkness. For me it is a good product for everyday use as long as you want to stay quite natural with just a healthy glow. If you are looking for perfect makeup looks I doubt how much help this is going to be. Maybelline Clearglow BB Cream: This is probably the first BB cream to have launched in India. It claims to do a 8-in-1 benefit for skin. 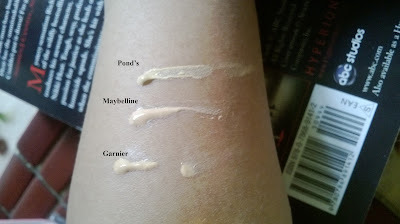 As per my experience it has a little better coverage but requires some time to get blended into the skin. If not blended properly it can appear whitish but with proper blending it appears very dewy and fresh. It is very moisturizing and is good for dry and mature skin types. Again women with oily skin like me can find it quite challenging as it may start to wear off. I have tried with the best of setting powders but the staying power during humid conditions is quite doubtful. It really does a good job of freshening and brightening the skin as per claims. Its hydrating capabilities are also quite superior and if blended properly it really even out the complexion beautifully with superior sun protection of SPF 21/PA+++. However, as far as the mattifying and concealing part goes, I don't think it does any good in the mattifying department but really gives you a very high dewy glow with a little bit of concealing. If you are looking for youthful and dewy glow and do not have oily skin this product is for you. 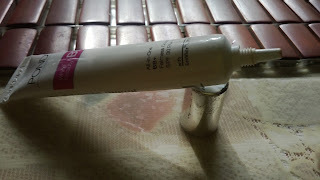 Pond's White Beauty BB+All in One Fairness Cream: I was quite sceptical in trying out this staff as I had once used a cream from the White Beauty range and was left with horrifying experience. However, surprisingly my experience with this product is quite different. It claims to be a All in One product that can take care of your skin, protect it as well as impart enhanced beautiful glow while covering flaws. The best thing I like about the product is its coverage. It has the best coverage amongst these 3 BB creams. However, it takes quite some time to set and get blended into the skin. You have to be quite careful to be quick enough to blend it on the face evenly. It is quite thick in texture unlike the previous 2 creams and can appear chalky if not blended properly. The 2nd best thing is the SPF factor.It has a SPF 30/PA+++ sun protection, which is very good in humid and sunny summers. This is one product that really gives a matte complexion and if set with a powder can stay on for long hours without melting. Obviously it does not conceal like a proper concealer, but if you are blessed with somewhat spotless skin, this product can really be all in one. As far moisturizing goes, you surely need a separate moisturizer prior to applying this, specially women with dry skins. If given a choice amongst these 3, my vote will definitely go for this one. Within a month or so I will be reviewing and comparing about the other 3 recently launched BB Creams- Revlon Photoready BB Cream Skin Perfector, L'Oreal True Match BB Cream and Colorbar Perfect Match BB Cream. Stay tuned.